Budapest is the capital city of Hungary. It is its country's largest city, and is home to approximately twenty percent of the nation's people. It serves as the country's principal political, cultural, commercial, industrial, and transportation center, and is considered an important hub in Central Europe. The city straddles the Danube in an exceptionally beautiful natural setting and was once popularly known as the "Queen of the Danube." Its two main parts, Buda and Pest, sit on opposite sides of the river and are connected by a series of bridges. Magnificent architecture from centuries past remains, and has earned the city a designation as a cultural World Heritage Site and a popular tourist destination. Budapest was the focal point of the Hungarian Revolution of 1848, the Hungarian Soviet Republic of 1919, Operation Panzerfaust in 1944, the Battle of Budapest of 1945, and the Revolution of 1956. It was the center of political drama in the late 1980s, when Hungary led the reform movement in Eastern Europe that broke the communist monopoly on political power. Under Soviet rule for 45 years, during the 1990s, Budapest underwent dramatic change with the collapse of that Empire. Despite its relative prosperity and experience with private enterprise, it was not immune to the upsets that resulted from its country's transition from a closed to an open society, both politically and economically. However, the city successfully weathered the changes and by the beginning of the twenty-first century had re-emerged as one of Europe’s most vibrant cities. However, there are issues that need to be addressed including the shortage of decent housing and acute problems such as crime, prostitution, and alcohol and illegal drug use. The city's suicide rate is alarmingly high, an issue to which answers must be found. Budapest, which covers an area of 203 square miles (525 square kilometers), straddles the Danube River on the flat terrain of the Great Plain in central Hungary. Buda, which is rather hilly, lies on the west bank, while Pest lies on the east bank. Budapest has a temperate, transitional climate—somewhere between the mild, rainy weather of Transdanubia and the variable climate of the flat and open Great Plain to the east. Temperatures in January average 30°F (-1°C) and in July 72°F (22°C). Winter snowfalls can be heavy, and the temperature may fall well below freezing. Heat waves plus humidity can make the summer oppressive. Mean annual precipitation is 24 inches (600 mm). The Danube enters the city from the north, and is only 755 feet (230 meters) wide at its narrowest point. The river, which regularly flooded Pest before controls were installed in the nineteenth century, has become heavily contaminated. Air pollution afflicts most districts in Pest. Castle Hill, which is 551 feet (168 meters) above sea level and crowned by the restored Buda Castle, is in a central location. A steep limestone escarpment known as Gellért Hill overlooking the Danube lies south of Castle Hill, and has the Citadel, built in the nineteenth century. Rose Hill, which is to the north of Castle Hill, is where Hungary’s elite own homes. Margaret Island is a mile-long park with hotels and swimming pools. The ornate Neo-Gothic Parliament Building faces Castle Hill on the Pest side of the river. The Inner Town, with streets laid out in an irregular pentagon, is the heart of Pest, and has offices, parts of the Loránd Eötvös University, and shops. The Inner Town Parish Church is Pest's oldest building. Andrássy Avenue, which runs straight from the center of Pest to City Park (Városliget) in which the Millennium Monument is located, is the finest thoroughfare in Budapest. Seven islands on the Danube around Budapest are Hajógyári sziget (Shipyard Island), Margit-sziget (Margaret Island), Csepel sziget, Palotai-sziget (a peninsula), Népsziget (connected to the above, but mostly surrounded by water), Háros-sziget, and Molnár-sziget. The northernmost part of Csepel sziget is a district of Budapest, while the other islands are parts of other districts. Buda Castle during the Middle Ages. In the first century B.C.E., Celts built a town called "Ak Ink," meaning "spring rich in water," which occupied about 30 hectares (74 acres) along the slopes of Gellért Hill. Romans occupied the town at the beginning of the Christian era, and by 106 C.E., this Roman settlement—Aquincum—became the main city of Lower Pannonia, with a population of about 20,000. The Romans constructed roads, amphitheaters, baths, and houses with heated floors in this fortified military camp. The Romans pulled out in the fifth century C.E. Huns invaded. After Attila the Hun (406–453) died and the Huns left, Germanic tribes, Lombards, Avars, and Slavs all passed through during the second Age of Migrations, which continued until the Magyars arrived in about 896. While other tribes spread across the entire Carpathian basin, the clan of Árpád (845–907) settled on Csepel sziget (Csepel Island), a large island surrounded by the deep waters of the Danube, forming a good defensive shelter for the settlers who began cultivating the south part of what later became Budapest. It was under the Árpád dynasty that Hungary became a Christian state, ruled first from Esztergom and later from Székesfehérvár. 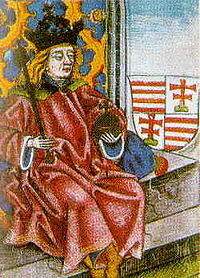 King Béla IV of Hungary (1206-1270) ordered the construction of reinforced stone walls around the towns and set his own royal palace on the top of the protecting hills of Buda. In 1361, it became the capital of Hungary. Buda became a Renaissance hub during the reign of Matthias Corvinus of Hungary (1458-1490). His library, the Bibliotheca Corviniana, held Europe's greatest collection of historical chronicles and philosophic and scientific works, second only in size to the Vatican Library. The first Hungarian university was founded in Pécs in 1367, and the second was established in Óbuda in 1395. 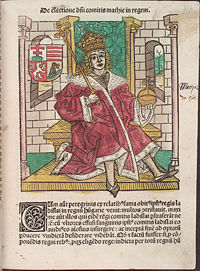 The first Hungarian book was printed in Buda in 1473. The Turkish occupation began in 1541 and lasted for more than 140 years. The Turks constructed fine bathing facilities there. The western part of the country not occupied by the Turks became part of the Habsburg Empire as Royal Hungary. In 1686 Leopold I liberated Buda but nearly destroyed the city in doing so. The entirety of Hungary was then incorporated into the Habsburg Empire. The Hungarian's struggle for independence and modernization dominated the nineteenth century. The national insurrection against the Habsburgs began in the Hungarian capital in 1848 and was defeated a little more than a year later. In 1867, the Reconciliation that brought about the birth of Austria-Hungary, made Budapest the twin capital of a dual monarchy. On November 17, 1873, Buda and Pest were officially merged with the third part, Óbuda (Ancient Buda), thus creating the new metropolis of Budapest. Dynamic Pest grew into the country's administrative, political, economic, and cultural hub. In 1910, 880,000 people occupied Budapest and 55,000 lived in the largest suburb of Újpest (now part of Budapest). World War I (1914-1918) brought the Golden Age to an end. In 1918, Austria-Hungary lost the war and collapsed; Hungary declared itself an independent republic. In 1920, the Treaty of Trianon finalized the country's partition, reducing Hungary's size by two-thirds and turning the multinational state into a nation-state. On March 19, 1944, the Germans occupied Budapest. At that time, there were 184,000 Jews and about 65,000-80,000 Christians-considered-Jewish in the town. Between 20 percent and 40 percent of Greater Budapest's 250,000 Jewish inhabitants died through Nazi and Arrow Cross genocide during 1944 and early 1945. Despite this, Budapest has the highest number of Jewish citizens per capita of any European city. In 1944, towards the end of World War II, British and American air raids partly destroyed Budapest. During the Battle of Budapest, from December 24, 1944 to February 13, 1945, Budapest suffered major damage caused by the attacking Soviet troops, and the defending German and Hungarian troops. The Germans destroyed all bridges. More than 38,000 civilians lost their lives. In 1949, Hungary was declared a communist People's Republic. The new Communist government considered the buildings such as the Buda Castle symbols of the former regime, and during the 1950s, the palace was gutted and all the interiors were destroyed. In 1956, peaceful demonstrations in Budapest led to the outbreak of the Hungarian Revolution. The Stalinist dictatorship collapsed after mass demonstrations, but Soviet tanks entered Budapest to crush the revolt. Fighting continued until early November, leaving more than 3,000 dead. From the 1960s through the late 1980s, Hungary was often satirically referred to as "the happiest barrack" within the Eastern bloc, and much of the wartime damage to the city was repaired. Work on Erzsébet Bridge, the last to be rebuilt, was finished in 1965. Budapest became the focus of national and international political drama in the late 1980s, when Hungary led the reform movement in Eastern Europe that broke the communist monopoly on political power. In May 1989, Hungary began taking down its barbed wire fence along the Austrian border—the first tear in the Iron curtain. In 1989, the Parliament adopted a "democracy package," which included trade union pluralism; freedom of association, of assembly, and of the press; a new electoral law; and in October 1989, a radical revision of the constitution, to provide for a democratic multi-party system. The country’s name was changed from the People’s Republic of Hungary to the Republic of Hungary. In September 1989, Foreign Minister Gyula Horn announced that East German refugees in Hungary would not be repatriated but would instead be allowed to go to the West. The resulting exodus shook East Germany and hastened the fall of the Berlin Wall. During the 1990s, Budapest underwent dramatic change. Despite its relative prosperity and experience with private enterprise, it was not immune to the upsets that resulted from its country's transition from a closed to an open society, both politically and economically. However, the city successfully weathered the changes and by the beginning of the twenty-first century had re-emerged as one of Europe’s most vibrant cities. Left to right: Mária Magdolna Tower, Matthias Church, Castle Quarter, Széchenyi Chain Bridge, Margaret Island, Danube Promenade, Parliament Building, Hungarian Academy of Sciences. Budapest is the seat of the Hungarian government, which is in the form of a parliamentary representative democratic republic. The president, elected by the parliament every five years, has a largely ceremonial role. The prime minister has a leading role in the executive branch as he selects cabinet ministers and has the exclusive right to dismiss them. The 386 members of the unicameral, national assembly (Országgyűlés) are elected for four-year terms—176 in single-seat constituencies, 152 by proportional representation in multi-seat constituencies, and 58 so-called compensation seats. A party must win five percent of the vote to gain representation in the multi-seat constituencies and the compensation seats. Budapest is also the seat of Pest County and Buda District. Originally, Budapest had 10 districts after coming into existence upon the unification of the three cities in 1873. In 1950, Budapest was united with several neighboring towns and the number of its districts was raised to 22 to create Greater Budapest. At that time, there were changes both in the order of districts and in their sizes. By 2008, there were 23 districts, six in Buda, 16 in Pest, and one on Csepel Island between them. Each district can be associated with one or more city parts named after former towns within Budapest. Budapest has a chief mayor, while each district has its own government and mayor. The Budapest Metropolitan Council, which is elected by the district councillors who are directly elected, formally controls the city through a management committee. Hungary has made the transition from a centrally planned to a market economy, with an estimated per capita gross domestic product of $19,000 in 2007—nearly two-thirds that of the European Union. The private sector accounts for more than 80 percent of GDP. Unemployment persisted above six percent through 2007, and Hungary's labor force participation rate of 57 percent is one of the lowest in the Organization for Economic Cooperation and Development. Budapest is the seat of government and the center of Hungarian transport and industry, as well as having half the nation’s university students, and about half the country’s income from foreign tourism. The major banks, foreign trading companies, the state travel agency, and the best shops are located in Pest’s Inner Town. Budapest became Hungary's main industrial center in the late nineteenth century, first a center for food processing, then manufacturing agricultural machinery and automobiles. By 2008, more than 50 percent of Budapest's factory employees work in metalworking and engineering, producing railroad equipment, buses, and river craft. The remainder work in textiles, electronics, chemicals, and in food processing. Budapest attracts over 20 million visitors a year. The city ranks 52nd on MasterCard's "World's Top 75 Financial Centers" list and 74th on Mercer Consulting's "World's Top 100 Most Livable Cities" list. The headquarters of the European Institute of Innovation and Technology was planned for Budapest. Budapest is the most important Hungarian road terminus, and is a major railway terminus. In the early 1970s, Budapest Metro's East-West M2 line was opened, followed by the M3 line in 1982. 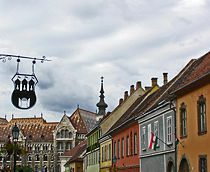 The city's public transport is provided by BKV, which operates buses, trolleybuses, an extensive tram network, suburban railway lines, the metro, a boat service, a cogwheel railway, and a chairlift called Libegő. The Danube river is easily navigable and so Budapest has historically been a commercial port (at Csepel). In the summer months a hydrofoil service operates up the Danube to Vienna. 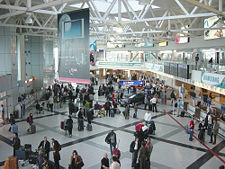 Budapest Ferihegy International Airport, which has three passenger terminals, is located to the east in Pestszentlőrinc. Population growth of Budapest (1870-2007). 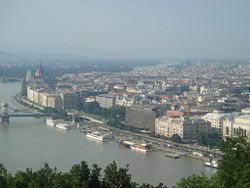 In 2007, Budapest had 1,696,128 inhabitants with a metropolitan area population of 2,451,418. Twenty percent of Hungary's population lives in Budapest, which is nearly 10 times larger than the nation's next largest city. The rapid increase of population, especially from 100,000 in the 1840s to 1,000,000 in 1918, has resulted from ongoing migration of people from villages and towns. Ethnic Magyars make up 90.2 percent of the population, Roma 0.7 percent, Germans 0.4 percent, and others (mainly Slovaks, Ukranians, Chinese) made up the remainder. Hungarian is the official language and is spoken by 93.6 percent of the population. Regarding religions, Roman Catholics made up 45.5 percent of the population, Reformed Church in Hungary 12.6 percent, Lutherans 2.6 percent, Greek Catholics 1.6 percent, Jewish 0.5 percent, Atheists 19.5 percent, and others (mainly a variety of Christian denominations) made up the remainder. The city's universities include: The Academy of Drama and Film, the Budapest University of Technology and Economics, the Corvinus University of Budapest, the Hungarian University of Fine Arts, the Jewish Theological Seminary—University of Jewish Studies, the Liszt Ferenc Academy of Music, the Moholy-Nagy University of Art and Design, and the Eötvös Loránd University (sometimes referred to as University of Budapest). Public services in Budapest are generally good, as are social and health services, particularly in the central areas of the city. Shortage of decent housing is one of the most pressing social problems. Acute problems are crime, prostitution, and alcohol and illegal drug use. The city's suicide rate is alarmingly high. In 1987, Buda Castle and the banks of the Danube were included in the UNESCO list of World Heritage Sites. Andrassy Avenue (including the Millennium Underground Railway, Hősök tere, and Városliget) was added to the UNESCO list in 2002. Budapest has the largest synagogue in Europe (Dohány Street Synagogue), the largest medicinal bath in Europe (Széchenyi Medicinal Bath), and the third largest Parliament building in the world, which contains the Hungarian Crown Jewels. The third largest church in Europe (Esztergom Basilica) and the second largest Baroque castle in the world (Gödöllő) are in the vicinity. Castle Hill and the Castle District have three churches, six museums, and a host of interesting buildings, streets and squares. The former Royal Palace is one of the symbols of Hungary—and has been the scene of battles and wars since the thirteenth century. It now houses two impressive museums and the National Széchenyi Library. The nearby Sándor Palace contains the offices and official residence of the President of Hungary. The 700 year-old Matthias Church is one of the jewels of Budapest. Next to it is an equestrian statue of the first king of Hungary, King Saint Stephen, and behind that is the Fisherman's Bastion. Statues of the Turul, the mythical guardian bird of Hungary, can be found in both the Castle District and the Twelfth District. In Pest, the most important sight is Andrássy út. As far as Kodály Körönd and Oktogon both sides are lined with large shops and flats built close together. Between there and Heroes’ Square the houses are detached and more grand. Saint Stephen's Basilica, also located in Pest, is named in honor of Stephen, the first King of Hungary (c. 975–1038), whose mummified fist is housed in the reliquary. There are Roman remains at the Aquincum Museum, and historic furniture at the Nagytétény Castle Museum. Heroes’ Square is dominated by the Millenary Monument, with the Tomb of the Unknown Soldier in front. To the sides are the Museum of Fine Arts and the Palace of Arts, and behind City Park opens out, with Vajdahunyad Castle. One of the jewels of Andrássy út is the Hungarian State Opera House. Budapest has continental Europe’s oldest underground railway, most of whose stations retain their original appearance. Hungarian cuisine and café culture may be sampled at Gerbeaud Café, and the Százéves, Biarritz, Fortuna, Alabárdos, Arany Szarvas, Kárpátia and the world famous Mátyás Pince Restaurants. Budapest, which straddles the Danube in an exceptionally beautiful natural setting was once popularly known as the "Queen of the Danube." Its two main parts, Buda and Pest, sit on opposite sides of the river and are connected by a series of bridges. Magnificent architecture from centuries past remains, and have earned the city designation as a cultural World Heritage Site and a popular tourist destination. Approximately twenty percent of the nation's people live in Budapest, which is nearly 10 times larger than the nation's next largest city. It is the political, administrative, industrial, commercial, and cultural capital of Hungary. The country's television and radio broadcasting, as well as its film industry, are centered in Budapest, as is the majority of publishing and press enterprises. Libraries, museums, art galleries, orchestras, sports facilities, and theaters are said to be the best found in Hungary. Budapest was under Soviet rule for 45 years and required a dramatic transition from a closed to an open society, both politically and economically. The city successfully weathered the changes and by the beginning of the twenty-first century had re-emerged as one of Europe’s most vibrant cities. While Budapest is a popular and beautiful city with generally good public services, there are issues that need to be addressed including the shortage of decent housing and acute problems such as crime, prostitution, and alcohol and illegal drug use. The city's suicide rate is alarmingly high, an issue to which answers must be found. Barber, Annabel. Visible Cities Budapest: A City Guide. Somerset, Ltd., 2004. ISBN 978-9632129860. DK Publishing, Budapest: Eyewitness Travel Guildes. DK Travel, 2007. ISBN 978-0756624354. Encyclopaedia Britannica. Budapest. Retrieved August 9, 2008. Sugar, Peter F., Péter Hanák, and Tibor Frank. A History of Hungary. Bloomington: Indiana University Press, 1990. ISBN 9780253355782. Ungvary, Krisztian. The Siege of Budapest: One Hundred Days in World War II. Yale University Press, 2006. ISBN 978-0300119855. This page was last modified on 7 July 2016, at 15:48.